We have used AP Professional Security Services for a couple of years and have not been disappointed. The officers show up on time and are very courteous. It is great to have a professional staff to depend on when we have large events with 3,000 plus people or if they are watching over $300,000 worth of merchandise overnight in our tent. I know that when we call upon this group we will get the best of the best and do not have to worry. They work with you to get all of the details prior to the event or service and know what is expected of them before they begin. We have been using AP Professional Security for over two years to protect our property. The offers assigned here are professional and well trained. We are very pleased with the services provided to us. 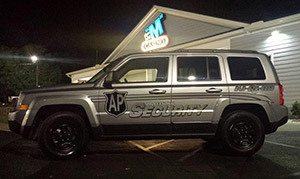 Tim Moore and AP Security have provided security services for our company’s clients for many years... AP Security performs to the highest of standards. The guards are appropriately attired with obvious training and proper protocol in place...Importantly, the owners of the company are always accessible when we’ve felt the desire to contact them. AP Security is a professional, experienced, reliable, “hands-on” security company. Every employee that I have had dealings with at AP Professional Security, LLC has been fantastic to work with and quick to respond to requests. The initial estimate and account set-up process was fast and easy with a lot of flexibility in scheduling. The security officer assigned to us is friendly, dependable and extremely conscientious about the responsibility of his position. AP Professional Security, LLC definitely lives up to their name with the highest level of professionalism delivered. We have used AP Security for security work on several occasions. They have performed security work at our cattle farm, our office and shop as well as our home. Ronald Failor, Security Manager and his employees have always been prompt, courteous and very easy to work with. They do good work and we highly recommend them for your security needs. We would like to thank you for your services; the Security professionals you have on our property are just that.... professionals. They do a good job. I am an owner for 18 yrs at this condo complex and this is the FIRST reliable, caring, common sense, not afraid to do the job, group of security guards we have ever had. Keep up the good work, we are so glad to have you here. Awesome Service! I've been using this company for security since 2015. They are always accommodating and surpass my expectations. Many times I have called for service on short notice, and AP Professional will work a miracle to get the coverage I need. The rates are very reasonable and service is always reliable, on-time and professional. Two years ago, when everyone on our property was struck with terror from those unsolvable break-ins that were devastating everyone at OFVs, our security contract was then given to AP Professional Security Officer Services and within a few weeks they captured the perpatrator. AP Professional Security Officer Services uses highly skilled professionals with criminal and law enforcement training. Most have former military and civil police backgrounds. Their performance has been outstanding, effective, efficient and professional.